Cruciate ligaments are located inside the knee joint. They directly hold the joint in between the Femur and Tibia, they are two thick, tough and fibrous bands. They look like the collateral ligaments that were discovered in primitive femorotibial joints. They support the knee joint anteroposteriorly. According to their site of attachment to the tibia, they are named anterior and posterior. 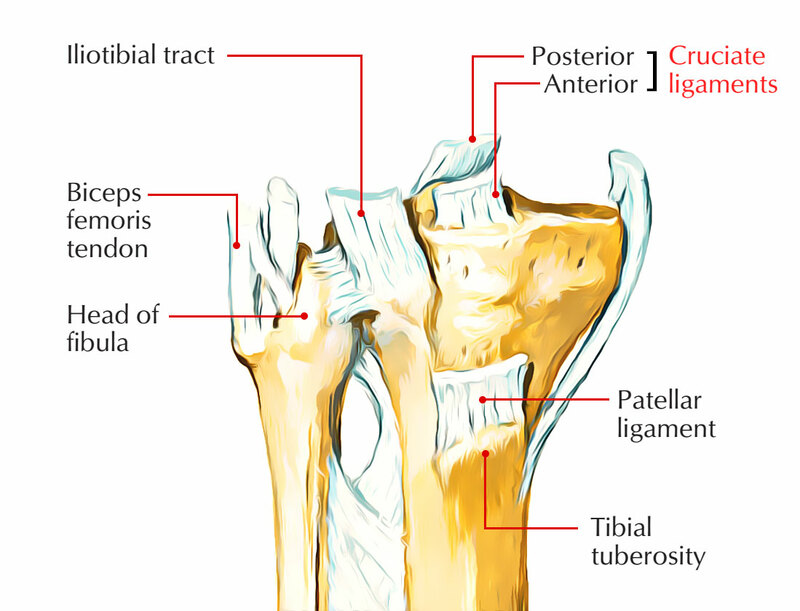 The anterior cruciate ligament posteriorly goes up to connect to a plane at the back of the lateral wall of the intercondylar fossa of the femur and connect to a facet on the anterior aspect of the intercondylar region of the tibia. The posterior cruciate ligament ascends anteriorly to connect to the medial surface of the intercondylar fossa of the femur and connect to the posterior side of the intercondylar area of the tibia. The function of the cruciate ligaments depends upon the anatomic configuration of their attachments as the primary restraints to knee motion, i.e., their three-dimensional geometry. The biochemical crosslinking of the a variety of collagenous structures decides the mechanical properties of the cruciate ligaments.The forces that act in one direction or on one plane are unidirectional, uniplanar restraining and are based on capability of primary restraint to delimit joint motion in several degrees of freedom and the mechanical properties of the primary restraint. In its connection with the three-dimensional geometry of the joint surfaces and their capacity for elastic deformation under loading, the complete restraining function of the capsule and ligaments is vital. Ligament strain (elongation relative to primary length), tightness (increasing restraining force with displacement), compliance (distensibility), and terminal tightness are vital functional characteristics of ligaments along with their capacity for elastic and plastic deformation. The anterior cruciate ligament is connected under to the anterior part of the intercondylar area of the tibia. It runs upward, backward, and laterally and is attached to the posterior part of the medial surface of the lateral condyle of femur. It inhibits the posterior dislocation of femur on tibia and anterior dislocation of tibia on femur and is taut during extension of the knee. Emerges from the medial surface of the lateral femoral condyle. Mainly made from Type I Collagen and secondarily of Type III Collagen. Inserts into a wide area of the central tibial plateau. Middle Genicular Artery, which feeds a synovial plexus around the ligament, also supplies ACL. The medial and lateral inferior genicular arteries supply the plexus distally, however have a lesser contribution. ACL supplied by posterior branches of the tibial nerve. The neural tissue serves many functions within the ACL. The perivascular neural aspects surround the vascular plexus and feature in vasomotor control. Other nerve fibers operate to transmit slow pain impulses. The process of recruitment, or the progressive tightening up of ligamentous structural aspects is illustrated by the behavior of the ACL. At times when the knee is extended and then hyperextended from a position of 30 ° flexion. Increasing numbers of ACL fiber bundle units are employed, as the knee comes close to terminal extension, i.e., to oppose the forces of extension more and more fiber bundle units work together mechanically. By the spatial alignment of the PCL and popliteus system. The structures will end up being stretched beyond their viscoelastic capacity, and a partial or total rupture will occur, if the imposed physical forces surpass the restraining forces (regardless of maximal employment of all capsuloligamentous elements). The damage will extend to and include secondary restraints in accordance with the position of the joint and the system of injury, if the primary ligament restraint cannot reduce the effects of the energy acting upon the joint. Connected under to the posterior part of the intercondylar area of the tibia. Connected to the anterior portion of the lateral surface of the medial condyle of the femur. Prevents the anterior misplacement of femur on tibia and posterior misplacement of tibia on femur. Travels to the medial femoral condyle to the posterior tibia from the lateral aspect. The PCL is called due to its insertion on the posterior aspect of the proximal tibia. The PCL originates within, concave, wide semicircular area along the medial femoral condyle and the intracondylar notch. The PCL inserts into a depression exactly inferior to joint line, between the two tibial plateaus, and posterior to the libial spine. This depression is called the posterior intercondyloid fossa or PCL fossa. The typical length of the PCL as measured in 44 cadaver knees was 38 mm and the average width within the middle portion was 11 mm. The range of PCL width measurements was higher than that of the PCI, length measurements due to variation in intercondylar notch size. Utilizing comparative information from anatomic dissection with radiologic connection, an Austrian group acquired geometric anatomic information characterizing the dimensions of the anterolateral and posteromedial bundles and their footprints. In 15 cadaver specimens, the overall typical length and diameter of the PCL discovered was 37 and 11 mm, separately. The PCL has a large variation in shape and size of its femoral attachments, whereas the tibial attachments shapes and size are more consistent. Two inseparable however distinct bundles that enable resistance of posterior translation in both extension and flexion make the substance of ligament. Anterolateral bundle and Posteromedial bundle: The bundles are named by their position within the femoral footprint attachment. To help identify these bundles during dissection or arthroscopy, other anatomical landmarks have actually been recognized.